William & Mary sits squarely on the the Atlantic Coastal Plain, a region underlain by geologically young sand, silt, clay, and gravel. Many of these geological layers are fossiliferous, and even on campus we can find the preserved remains of 4 million-year old clams and scallops. What we don’t have is easy access to rocks, the nearest natural outcrops of ‘hard rocks’ – granites and gneisses are 80 kilometers (50 miles) to the west in the Fall Zone. In our classes that focus on earth materials and structures we must travel west to the rocks and structures. 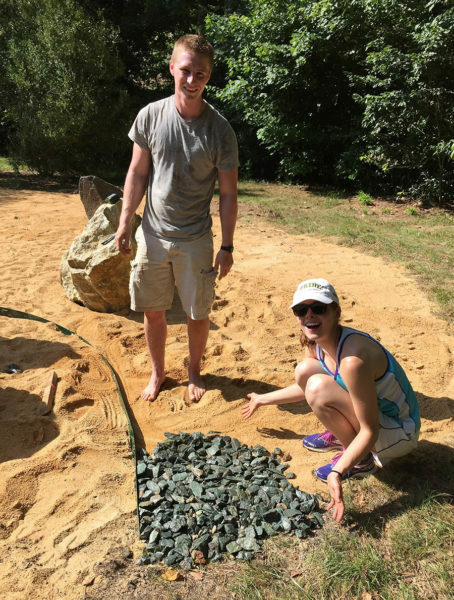 We decided it was time to bring the rocks to us, and grow our own rock garden on the William & Mary campus. Our plan was to create a beautiful space here on campus in which people could study and reflect upon the Earth. What follows is a brief history and timeline of the William & Mary Geology Rock Garden. Alums & friends take in the new William & Mary Geology Rock Garden at Homecoming 2017. Over the past few years, Professor Linda Morse and the Student Environmental Action Coalition (SEAC) have worked to restore the forest around W&M’s scenic Crim Dell. Last year SEAC received funding to continue their work at Crim Dell, and these funds also helped to get the Geology Rock Garden project rolling – as the rock garden is designed to mitigate storm water runoff into Crim Dell. Linda worked closely with John McFarlane, W&M’s Associate Director of Gardens and Grounds, to select the site on Old Campus in the Crim Dell Meadow. 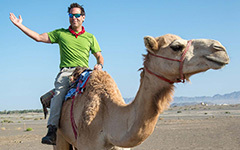 We had a plan and a site, but we needed rocks – the bigger the better. W&M Geology alum Denton Willis and his family own a passel of quarries in western Virginia, and their Rockydale Quarries Corporation was more than happy to donate specimens to populate our garden. 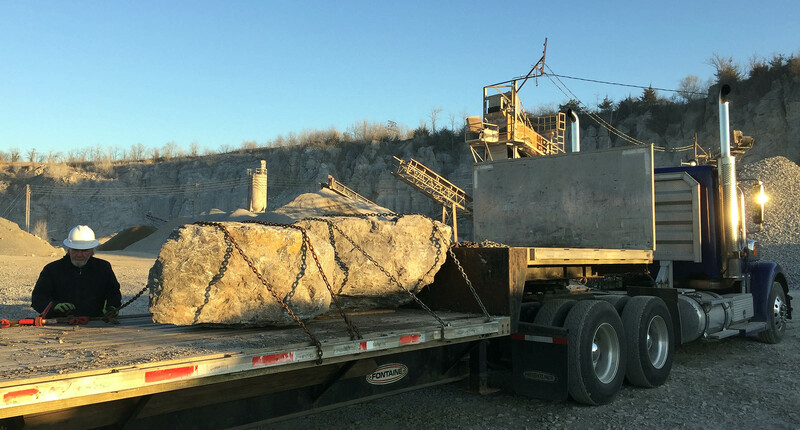 At sunrise on March 23, I arrived at the Rockydale quarry in Staunton, Virginia, as the quarry staff loaded two massive blocks of Ordovician carbonate rock onto a flatbed 18-wheeler. 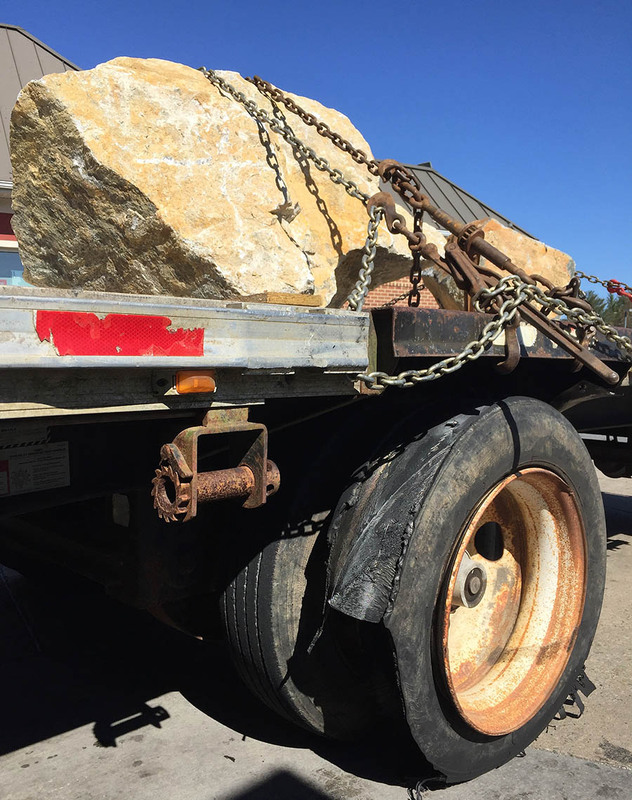 The first two rocks for the William & Mary Geology Rock Garden loaded and strapped on the flatbed trailer at Rockydale’s Staunton quarry. Tire blowout on the flatbed trailer that happened while transporting rocks to the William & Mary Rock Garden. From there we traveled over the Blue Ridge to the Rockydale quarry north of Charlottesville to pick up two more specimens, this time a massive Neoproterozoic granite and a somewhat smaller biotite-rich schist. With more than 5 metric tons of rock strapped in, it was time to roll onward to Williamsburg. A tire blowout in the western Piedmont slowed our roll, yet by mid-afternoon we’d arrived on campus with our heavy cargo. John Mattie, W&M’s landscape supervisor, and his grounds crew deftly off-loaded the rocks and moved them into place. The largest block of limestone was a challenge to move, but John’s crew was undaunted. Some of our newly acquired rocks needed a proper scrubbing, weathering had taken its toll on their surfaces – the department power washer did its job and the inner beauty of these rocks was now revealed. 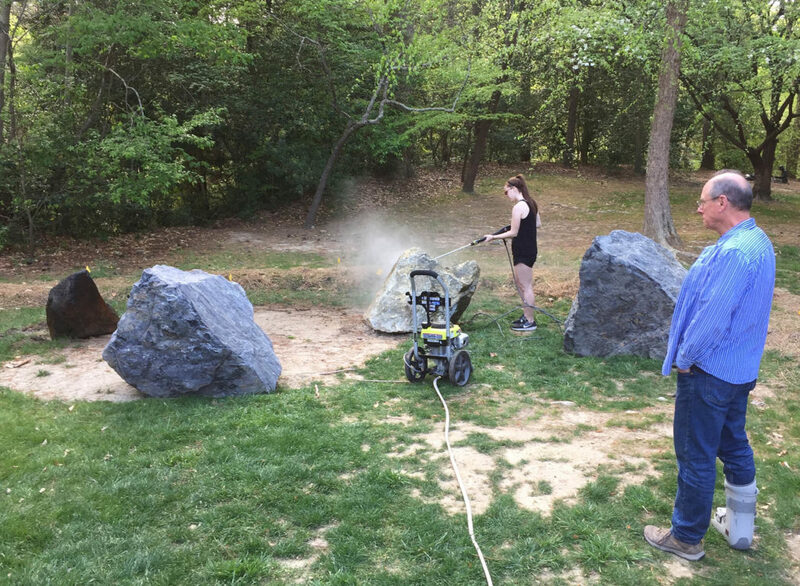 Cece Hurtado (W&M Geology class of 2017, and the current Geology Research Fellow) power washes a granite block during the formative period of the William & Mary Geology Rock Garden. Professor Brent Owens works on his managerial skills. The Class of 2017 graduated on May 14, and a few days later I was off to Arctic Norway for our Geology 310 field course. Over the next month, our four big rocks lay comfortably in a quiet corner of campus. By mid-June, the department was filled with students and faculty working on collaborative research projects. It was time to get back to the business of growing a rock garden. Our summer work began with the Luck Stone Corporation graciously donating and delivering gravel and sand for the project. The sand went down first and forms the base layer, onto which we spread the gravel. The gravel is crushed stone – that is it’s quarried from the bedrock and then crushed and sieved to a particular size. The chunks in our gravel base are known as #3s, they’re angular pieces between ~2 and 5 cm (1/2 to 2”) in diameter. The #3s form a sturdy and robust surface layer to the garden. John Mattie’s crew first created a shallow depression backed with a low berm on the downslope side, that was topped up with the sand and gravel. Rain water and overland flow is checked by our little basin, and as such, it serves to store and then slowly release storm water into the Crim Dell watershed. The gravel foundation at the William & Mary Geology Rock Garden. Top – maroon mudstone from the Culpeper Triassic basin, Bottom – greenstone from the Neoproterozoic Catoctin Formation. Note – oak leaf for scale. 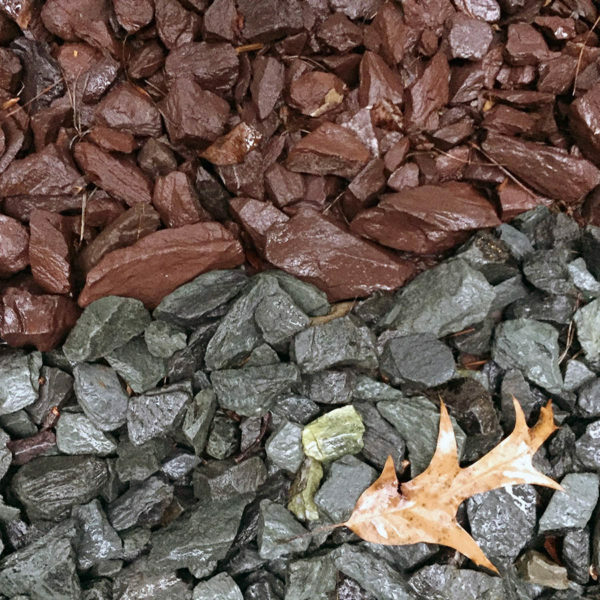 Our gravel comes from two of Luck Stone’s quarries – their Shadwell operation, just east of Charlottesville, quarries greenstone from the Catoctin Formation, its distinctive blue-gray-green rock forms the foundation for ¾’s of the garden. The rest is a maroon mudstone from the Mesozoic Culpeper basin. Professor Rowan Lockwood takes her Age of Dinosaurs class to this quarry to see the track ways of early dinosaurs that once roamed these Triassic mudflats. If you visit our rock garden, take a few moments to look closely at the gravel – these are interesting rocks and there is much to see in the gravel including a suite of accessory minerals, veins, and even ancient mudcracks. W&M geologists Mark Simonds and Katie Valery savor the first wheel barrow load of gravel spread on the William & Mary Geology Rock Garden. There were about 300 loads left to spread! Spreading the gravel was a labor of love. The gravel arrived coated with finer-grained sediment (sand and mud, all of which was small enough to go through the screens when the crushed stone was sieved). We set up a curious, but critical, operation of washing gravel at the big piles, then ferrying the ‘clean’ gravel, by wheelbarrow some 80 m (250’) to the rock garden. The rock garden is about 10 meters on a side (33’) with a total footprint of ~100 m2, that ultimately translated into nearly 300 wheelbarrow-loads. The burden of shoveling, washing, hauling, and spreading tons of gravel (literally, tons and metric tons at that! ), was borne by a crew of summer research students, faculty, and even a couple of inveterate alums. By early August we had the gravel foundation set. 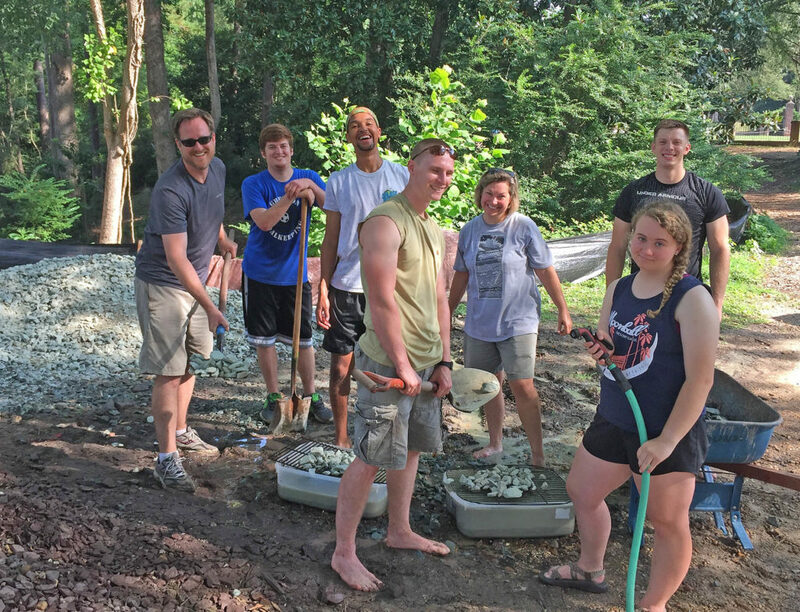 A happy crew of Geology students and faculty in the midst of shoveling, washing, and hauling gravel for the William & Mary Geology Rock Garden. Notice the size of the gravel pile in the background. We even brought in accessory rocks – these are rocks that had been collected over the years on William & Mary geology field trips and brought to campus in the back of vans. For instance, my 2017 Earth Structure & Dynamics students liberated a chunk of fault-breccia from an outcrop in the Blue Ridge Mountains, then gingerly carried the block to a van, and today the breccia is nestled in the garden for all to see. In mid-August two more massive rocks were added, and we constructed a rock bench using granite pavers to form the base and a slab of mylonite as the sill. As the fall semester opened, I took my Field Methods class to the rock garden for their first academic adventure of the term. By the end of the semester, they’ll have created an online interactive guide to the rock garden that will be both pithy and educational. My colleagues have plans for employing the rock garden across our geology curriculum – from introductory courses to upper-level research-based classes. 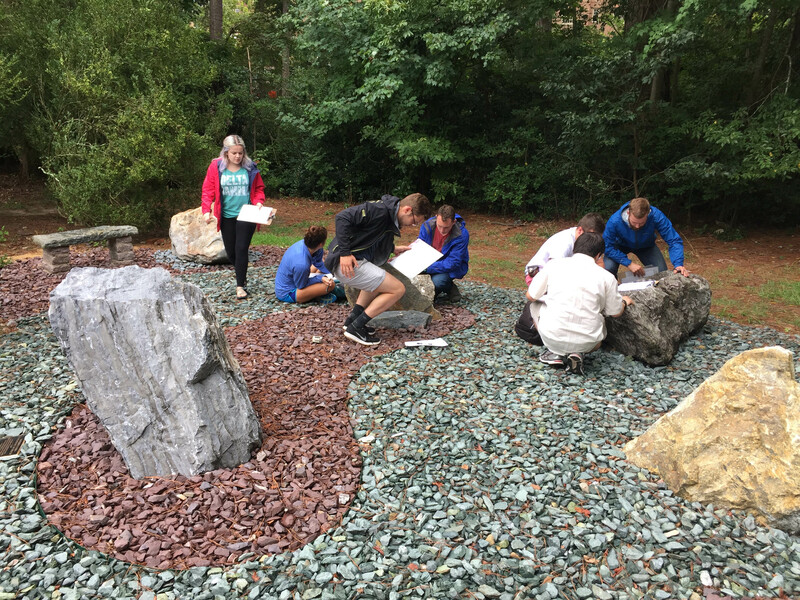 Some of the 2017 Field Methods class making the first detailed rock descriptions in the William & Mary Geology Rock Garden. We’ve got room to grow, and over the next few years we’ll be adding new samples. Our vision is to create an artistic and educational space bursting with geologically diverse samples. We’d love to engage with William & Mary artists to craft sculpted works from distinctive stone. Ultimately, we want the William & Mary Geology Rock Garden to be an iconic campus destination. For the Bold? 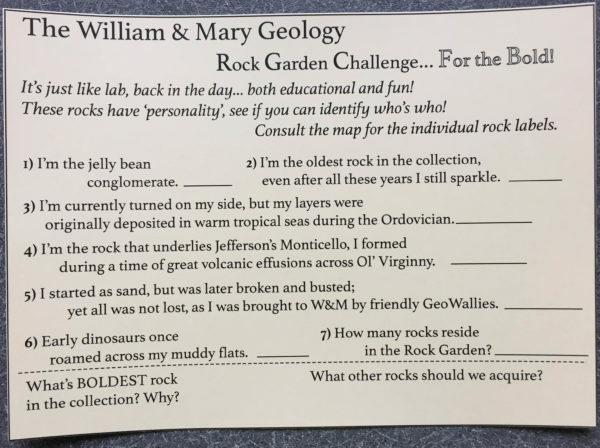 The William & Mary Rock Garden Challenge (version 1.0). Click on the image for a larger view of the Challenge! 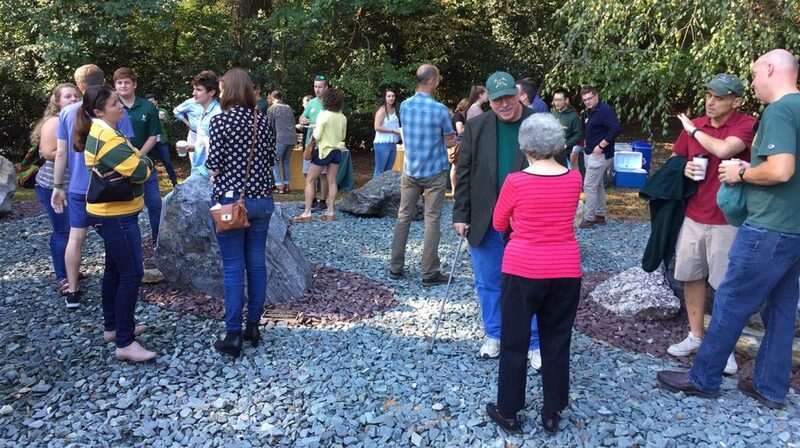 At Homecoming we held the Geology Department reception in the rock garden. The weather was splendid, and the turnout was exceptional as we had alums from five decades join the party. 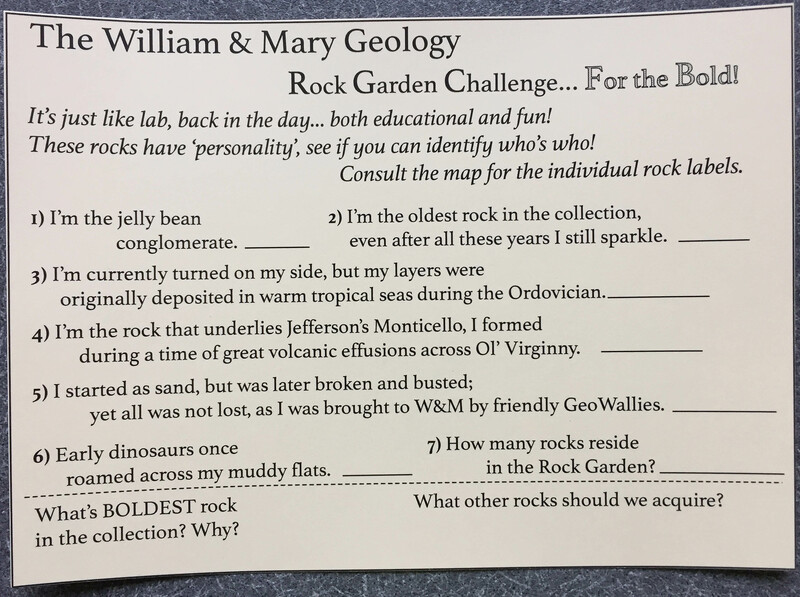 The boldest of the bunch even took the William & Mary Geology Rock Garden Challenge! 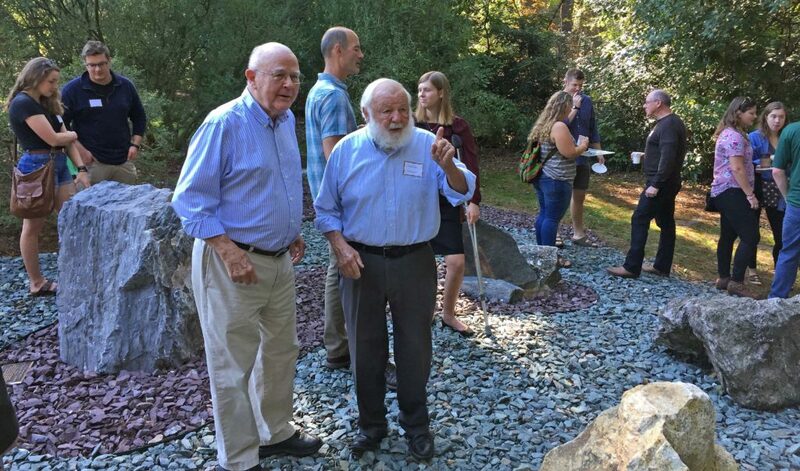 Retired geology professors Steve Clement and Jerre Johnson share a moment at the 2017 Homecoming reception in the William & Mary Geology Rock Garden. Next time you find yourself on William & Mary’s brick-filled campus, take a break from the bricks and visit the William & Mary Geology Rock Garden – it’s tucked into the wooded grove between the Sunken Garden and Crim Dell (for those who like more precision, it’s located at latitude 37.2706˚ N, longitude 76.7128˚ W). Many thanks to Denton Willis, Tom Wharton, and John DePasquale of the Rockydale Quarries Corporation for both their donation and logistical support. Luck Stone’s Bruce Faison, Rick Rowland, Max Massie, and Traci Chinault made the sand and gravel foundation possible. John McFarlane and John Mattie’s Grounds crew were fabulous partners – thanks! Great work!! Very exciting!! But it seems that everyone has forgotten about the very first rock that was acquired by the geology dept. for a future rock garden. It had some gorgeous ripple marks from the Hampshire (?) formation and was collected during a field trip and loaded in the back of the van by a couple of super strong geologists. The last time I saw it it had been left by a light post in the loading dock area to wait for a future home. Is it still there? Yes, that original rock is still right by the same light post and I can see it from my office window. Indeed, we need to get that lovely sample moved over to the Garden as it’ll make a lovely accessory rock.